Villas Salvia can accommodate up to 6 people and are ideally suited to families, friends and groups travelling together. Spread over 2 floors, their generous size and open plan layout means there is plenty of space for everyone to spend time together as well as enjoy their own activities. The furnished terrace is the ideal place for guests to enjoy wonderful views stretching far into the distance. Each villa has its own design, whether traditional or contemporary, and invites the guest to enjoy spacious, modern living. Salvia is a beautiful double height living room featuring elegant beams which give an airy and bright feel. Comfortable sofas create a cosy relaxing space on cool evenings. All of our villas boast fully equipped kitchens including dishwasher, washing machine, microwave and oven so guests have all the facilities they need during their stay. Nestled in beautiful countryside and enjoying breathtaking views over Val di Chiana, Cignella began its life over 200 years ago as a pig rearing farm with a farmhouse and sheds in its grounds. As agricultural needs changed it fell into disrepair and the current owners, seeing its potential, wanted to share its wonderful location with others so work began to convert the old farm into luxury 4 star accommodation. 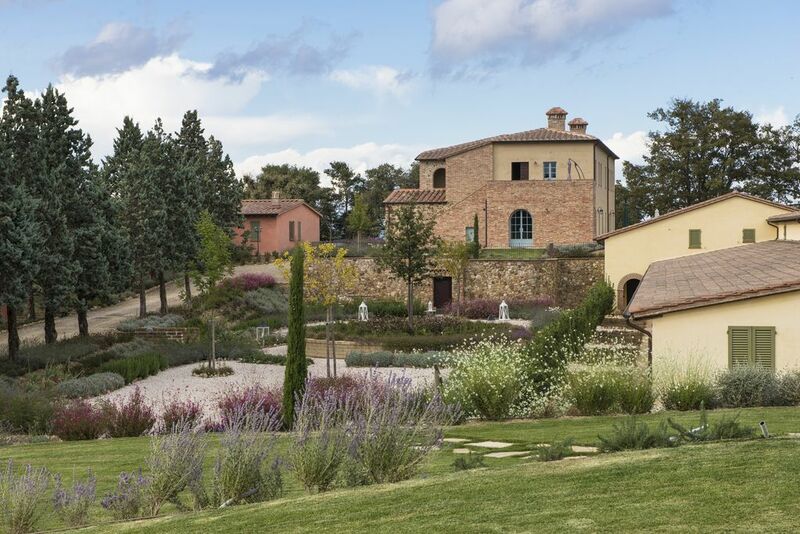 The Cignella you see today has been lovingly renovated in the same footprint as the old farm, and with the original farmhouse still standing. The roofs, rafters and beams have been skilfully restored using local materials and traditional techniques so their appearance is the same as centuries ago. With a genuine interest in the style and design of Cignella, everything you see today in the villas and apartments, including the furniture, paintings and soft furnishings, have been personally sourced by the owners and their family, from outlets in the surrounding countryside. Decorated in traditional Tuscan colours, guests are always reminded of the Italian culture that has been present in this location for centuries. The need for modern day appliances has not been forgotten and care has been taken to ensure guests have all the facilities they need during their stay. We opened our doors in 2014 and have been delighting our guests ever since. Many return year after year and the secret, we think, is because we enjoy what we do and are only happy when you are happy. We care about our guests and listen to their needs and requests…..nothing is ever too much trouble, you just need to ask! As of April 15th 2018, a tourism tax will be applicable upon all bookings - a charge of €1 per person per day, which will be due in cash on departure. This charge will not be applicable to children under 12 years old. Our stay at Cignella was everything that we had hoped for & more. The amenities, the accommodation and the service that was provided during our stay was fantastic. Staying in the 'rolling hills' of Tuscany was an absolute joy. We can't wait to come back!